Qik. Streaming video right from your phone. 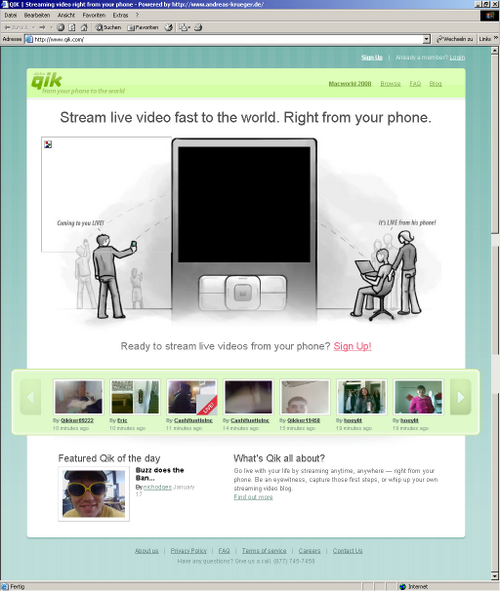 Saw some live coverage from the MacWorld earlier this week where ppl used this service to directly stream video from their phone to qik.com. Something like YouTube, but with the difference that everything is streamed live from the phone (Nokia N95) onto their servers. Meaning: you’ll need a decent broadband network connectivity for this to work fine. Signed up for this service (which is still alpha) on tuesday evening and just received an invitation. Don’t know about 3G speed outside, but here @home with DSL 2048 kbit/s down & 192 kbit/s up maximum speed it’s just very charming. Haaiaa. Will need to test it again outside tomorrow in daylight and see how it is performing. And yes, I am bit shy on camera. That’s why I haven’t really made use of seesmic so far (the “video twitter”). You may have seen it in action earlier last month when Robert Scoble blogged about it. Why is it interesting? After all, I wouldnt want to put myself online. It’s interesting because a) it enables true LIVE coverage and b) memory space is limited on some phones, so with a service like this, ppl can just report until the battery is drained. As for the “live” part: I pressed the F5 key to refresh the user page right after I had stopped recording and there it was, my video. Dead simple. The latest Nokia range, imho those who are based on the S60v3 platform. Citizen Media, here we come… muahahahaha! EDIT: Loic just twittered that Seesmic is now compatible with mobile phones via Shozu.com. Shozu! Has anyone tried it so far? Had it running on my mobile some month ago but it quickly drained the battery, also due to some autostart scripts that load when the phone boots (!) up. – I guess all these tools only make sense when your phone is within a 3G or better network and when everything is interconnected, i.e. feeds that pull content from your various multimedia resources online and aggregate them on your blog. Should be an interesting task for a WP plugin (hint, hint :-)….something that pulls content from your video & microblogging platforms and creates a blog post out of it. In short: what I would like to have is a smooth way to blog-on-the-go and have it appear on my own blog (and not somewhere on flickr, vox, seesmic, qik, YouTube, etc.). Possible? Maybe one day (soon). EDIT 2: QIK works fine even via a normal (= slow) GPRS connection! Awesome. I will use it more often now.